Resolution is a measure of the quality of the data that has been collected on the crystal containing the protein or nucleic acid. If all of the proteins in the crystal are aligned in an identical way, forming a very perfect crystal, then all of the proteins will scatter X-rays the same way, and the diffraction pattern will show the fine details of crystal. On the other hand, if the proteins in the crystal are all slightly different, due to local flexibility or motion, the diffraction pattern will not contain as much fine information. So resolution is a measure of the level of detail present in the diffraction pattern and the level of detail that will be seen when the electron density map is calculated. High-resolution structures, with resolution values of 1 Å or so, are highly ordered and it is easy to see every atom in the electron density map. Lower resolution structures, with resolution of 3 Å or higher, show only the basic contours of the protein chain, and the atomic structure must be inferred. Most crystallographic-defined structures of proteins fall in between these two extremes. As a general rule of thumb, we have more confidence in the location of atoms in structures with resolution values that are small, called "high-resolution structures". 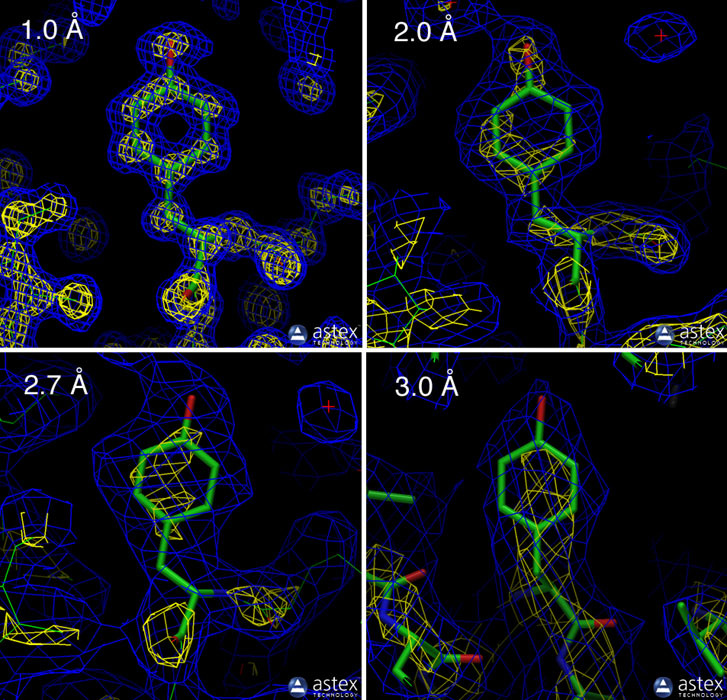 Electron density maps for structures with a range of resolutions are shown. The first three show tyrosine 103 from myoglobin, from entries 1a6m (1.0 Å resolution), 106m (2.0 Å resolution), and 108m (2.7 Å resolution). The final example shows tyrosine 130 from hemoglobin (chain B), from entry 1s0h (3.0 Å resolution). In the pictures, the blue and yellow contours surround regions of high electron density, and the atomic model is shown with sticks. The electron density was imaged using the Aster viewer.